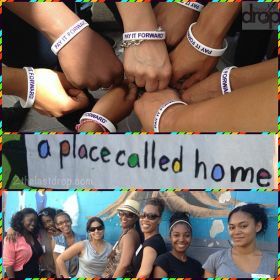 A Place Called Home is a safe haven in South Central Los Angeles in which underserved youth are empowered to take ownership of the quality and direction of their lives through programs in education, arts, and well-being. The organization was founded in 1993 by Debrah Constance in the wake of the civil unrest and riots the year before. Debrah wanted to give gang-affected youth in the area a safe place to go after school to do their homework, get a snack, watch television, hang out with friends, and be with caring adults--basic needs that all young people have. What began with 12 children getting together in the basement of a neighborhood church has grown to 300 children and teens utilizing the resources of a 25,000 square foot facility daily. Organic fruit and vegetable gardening program; nutritious snack and lunch program; exercise and organized sports; and emotional and psychological counseling. Tutoring and homework assistance and SAT preparation; paid internships; drop out prevention; college scholarships; and life skills training. Classes in dance, digital media, music and the visual arts. Mentoring program as well as rites of passage programs designed especially for young girls transitioning to womanhood and young men transitioning to manhood. Back to School Fest during which school supplies and clothing are distributed to participants; the Community Thanksgiving Dinner during which meals are served and groceries distributed; Home for the Holidays at which books, toys and other articles are distributed; and the Cinderella and Prince Charming Project during which juniors and seniors participate in self-improvement activities and are gifted clothing for the prom and graduation. Classes in life skills, health and wellness and other subjects.